Contains a potent blend of two desert cactus plants, Hoodia and Caralluma, that inhibit hunger by foolling the brain into thinking that the stomach is full, even when it's not. Enhanced with green tea polyphenols to boost fat-burning. Warning: Consult a physician before using this or any product, if you are pregnant, lactating, or have any medical condition. 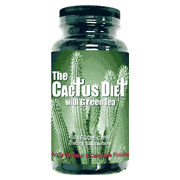 The Cactus Diet is shipped in a discrete, unmarked package. Orders are processed immediately and usually take about 3 to 5 working days to be received. We do ask that you try it for 2 to 3 weeks to feel the full effects. Any information received is used only for order processing and shipping purposes. Your information, such as e-mail address, will never be disclosed to a third party.